I have a confession to make: I love packing school lunches. I know, I know. I'm a freak. I'm a tad obsessed with providing healthy food for my kids, not just because of the nutrition value and fuel for their growing bodies, but because I have such a wacky relationship with food. If it was a Facebook relationship, we'd be "it's complicated". So I strive to create a life where they won't have this; where they won't be screwed up like me. Which is what all my parenting is about, really. Not screwing them up too much. Just enough to be funny. Naturally, packing a lunchbox lets my little inner, obsessive compulsive health nut come out to play. She's my shoulder angel and tells me to "use more quinoa" and "chia seeds would make an excellent addition to this dish!". On the opposite side, we have my shoulder devil. The one who says "dude, canteen is open today, have a sleep in and he can order a sausage roll... don't forget the sauce". It is an eternal battle because, well, I'm bone lazy. So how is it someone like me can enjoy packing lunches and actually manage to pack a healthy lunchbox every day? By nurturing my lazy side and getting organized. Because I value my sleep ins. After the dishes are done, I immediately dirty some more by making the next day's lunches and popping them in the fridge. Mornings are for rushing around, bleary eyed and telling children to put their shoes on for the FIFTIETH TIME. We use those fancy pants reusable wrappers and have no problem with wraps or bread going stale over night. 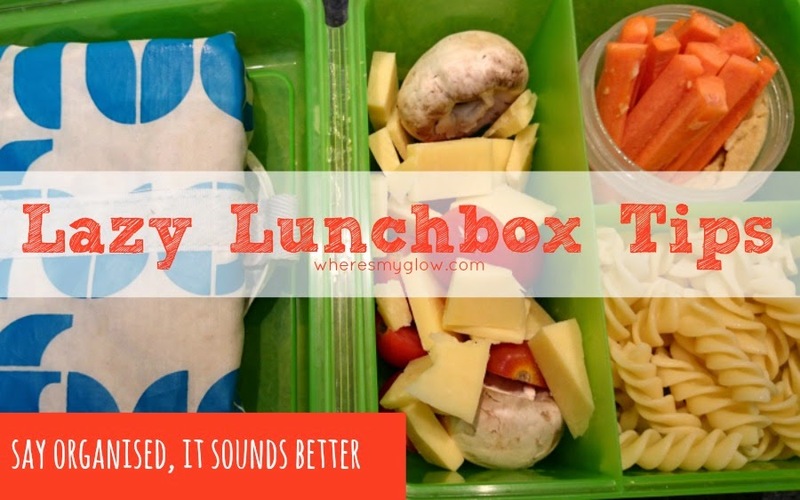 Added bonus: The lunchbox contents stay colder longer because the whole thing has been cold over night. I love a good themed lunch, I truly do. And the creations I see all over Instagram? CUUUUTE! I've even been known to attempt a few myself on special occasions. But for school? Every. Single. Day? Nup. Ain't nobody got time fo' that. OK, so some people do have time for that, but if you don't, don't panic! The humble sandwich is the bomb diggety, yo. Or bring out the big guns and put the filling in a wrap. Bung in a banana or add an apple. If you've got a liquid proof lunchbox and wanna get a bit more fancy, cut up a fruit salad, squeeze some lemon juice over it, and it will keep in the fridge for a few days or anywhere up to a week. Ladle it out in to your containers the night before and off you go. Kid not got a sweet tooth? Cubes of cheese, cherry tomatoes and chunks of cucumber go great with a couple crackers. Takes two minutes and it's colourful, delicious and healthy. Cook up a storm on the weekend of muffins, healthy brownies, muesli bars, whatever takes your fancy and then freeze them. Just before you walk out the door, grab one of the frozen morning tea treats and chuck it in - it will defrost by 10am on most days, unless you live in Tassie. I pack two lunches a day, so one batch of muffins gets me almost two weeks worth of healthy, homemade recess noms. If you're super lazy/organised, you can pre-make a week's worth of sandwiches (depending on the filling) and freeze them. Added bonus: Frozen food doubles as a cold pack! Woot! On walking through the door, Tricky knows his first job is to take his lunchbox and drink bottle out of his bag and place them on the bench, then hang his bag up on his hook. Look at that, half the job mentioned and I haven't lifted a finger yet. BOOYAH! Empty out any crumbs, rinse it under the tap and wipe down any reusable wrappers. Don't even get a teatowel out, let that sucker drip dry on the dish drainer. It's all well and good to be super organized *coughlazycough*, but if your kids won't eat what you have provided you're in a bit of a pickle. Wait, do your kids eat pickles? 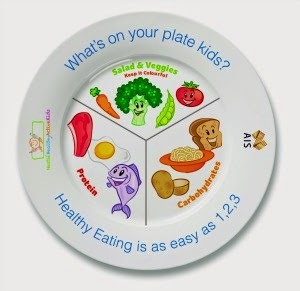 The Healthy Active Kids resource, established in 1999 (though it sounds cooler if I say last century) is designed, as the name suggests, to encourage kids to eat healthy and be active. It's a resource for families, with games and recipes, plus lesson plans and worksheets for teachers. In an effort to promote a fit lifestyle, the site has indoor and outdoor game suggestions, as well as ideas for family activities that aren't just sport. Which, phew, because I don't do sport. My favourite part is the video section, with segments on how to read a nutrition panel, why we eat what we eat, interviews with athletes from the Australian Institute of Sport, and many more. And it's all completely free. Hurrah. I'd love to see the site expanded to include a few more recipes (there are only nine), particularly in terms of healthy snacks (for 3:45pm when Tricky swears he is about to starve to death) and, of course, more lunchbox options. Maybe even some colouring in pages and matching activities for the littler kids. As it stands though, it's been incredibly successful with schools reporting 90% of students changed their eating habits for the better after participating. So kudos to them. I've got some Healthy Active Kids prize packs to give away, consisting of portion plates, lunchbox stickers and aprons. To win a pack, tell me what you do to encourage your children to be Healthy Active Kids.